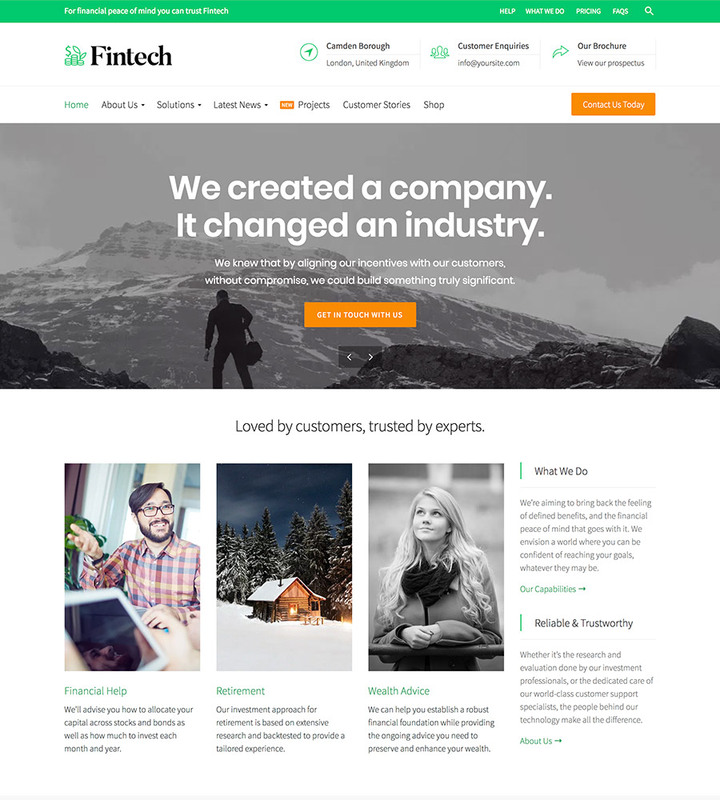 Fintech is a professional WordPress theme that's perfect for startups or the financial and technology sectors. The Fintech sector is exploding right now but there’s a real lack of quality themes for Fintech businesses – this theme fixes that! After spending many hours studying dozens of the best Fintech websites we wanted to create a best in class WordPress theme for Fintech and startups in the financial technology sector in general. Before we made themes for a living we bought them just like you. We grew tired and frustrated of themes that were impossible to figure out how to use. Our customers love how we build our themes to be easy to manage and intuitive to figure out in minutes. Thousands of happy customers have told us we’re doing it right! Handcrafted services page will allow you to tell your story and detail how exceptional your business is and what you offer. The included Visual Composer page builder allows you to layout your pages with ease and precision, dropping tabs, images and charts into columns is oh so easy. Fintech is fully compatible with the leading SEO plugin on the market, Yoast SEO and passes Google’s Structured Data Testing Test Tool. Plus, when you do need help we’re here for you. Our customers rave about our world-class support team. With comprehensive documentation including a video install guide and speedy support which replies within 24 hours, you won’t be left stuck! With the Customer Stories template you can describe the benefit using your services has had on key demographics, creating trust with potential new clients. Theme quality, customisation and unbeatable customer support makes this theme a definite winner! Have purchased themes from Commercegurus before, and always look forward to their new releases. Would give more than 5 stars if I could. Grab this one while it's hot!